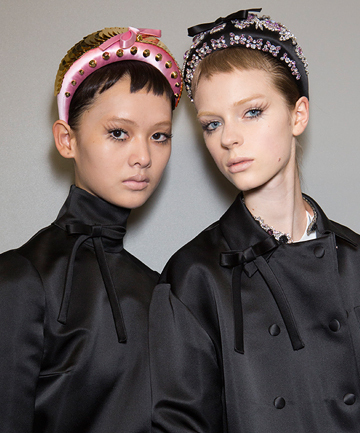 Hair accessories have never been more old-school than right now. Our favorite grade-school styles are back—think barrettes, flip clips, claw clips, scrunchies, headbands—but upgraded in a way that appeals to our adult selves. This season, headbands are supersized and just a tad more sophisticated. They were all over the spring runways and are already being sported by the street style set. You may already have a few headbands on rotation—now it's time to make room for the latest head-turning styles. These aren't the dainty, skinny headbands that can easily get buried in longer hair. These are bigger but much more versatile (and perfect for disguising greasy roots). Go for padding, velvet, knots, satin ribbons, bows, embellishment... Read on to shop some of our favorite headbands to try this season.